The UK has carried out a third round of aid drops to help thousands of people fleeing Islamist militants in Iraq. Meanwhile RAF Tornado jets are due to carry out surveillance operations to support aid deliveries, while four UK Chinook helicopters are expected to arrive in Cyprus on Wednesday night. Supplies dropped on Mount Sinjar so far include clean water and shelters. But shadow foreign secretary Douglas Alexander has urged the government to step up its humanitarian response. "Clearly the UK must now also be doing all that we can to assist the vital humanitarian effort that is under way to help save lives and prevent further suffering," he said. The UN has warned that tens of thousands of civilians are trapped on mountains in northern Iraq near the Syrian border by fighters from militant group Islamic State (IS). US forces have carried out a number of air strikes targeting IS militants near Irbil, the capital of Iraqi Kurdistan, while drones have also fired on jihadist fighters. America has also sent 130 more military advisers to the Kurdish region of northern Iraq. Jihadists are reportedly targeting Iraqi Christians and members of the Yazidi religious sect. About 35,000 people have escaped from the mountains into Syria and then into the Kurdistan region of Iraq in the past three days, with the UN warning they needed "life-saving assistance". 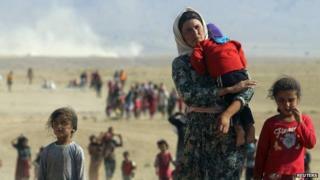 Some 700,000 Yazidis are believed to have been displaced. International Development Secretary Justine Greening confirmed a third round of UK air drops successfully took place on Tuesday night. There have now been five drops over three nights, which included 2,640 reusable water purification containers filled with clean water and more than 500 shelter kits to help shade the refugees in temperatures of more than 40C (104F). BBC political correspondent Carole Walker said the government had also agreed to transport supplies to Kurdish forces fighting IS militants.. Citing a senior government source, she said this should not be described as "arms". "The source said such an operation falls within the government's humanitarian effort as it is to help the Kurdish forces who are doing the most on the ground to protect civilians," our correspondent said. A No 10 statement said earlier that Britain had agreed to transport "critical military re-supplies" provided by other countries, while continuing with humanitarian missions. "Meanwhile urgent planning to get those trapped on the mountainside to safety will continue in the coming days between ourselves and US, the Kurdish authorities and other partners," it added. No 10 said the UK would also continue to "lead negotiations" on a UN Security Council Resolution that would make clear the "shared determination of the international community" to tackle the threat posed by IS. Taban Sami Shoresh, a British Kurd helping with the relief efforts, told the BBC she had never seen so many people "scramble for survival" when an aid helicopter landed. "All they wanted to do was get on the plane to be saved, and we could only take so much. It's horrific. It's heartbreaking to see," she said. "There is a humanitarian crisis here and we desperately need the help from all directions," she said. Speaking from Irbil in Kurdish-controlled northern Iraq, Ms Shoresh described how Mount Sinjar was "completely hemmed" by IS fighters. Meanwhile, former Conservative defence secretary Liam Fox told the Daily Mail that the UK would need to join in with military action being conducted by the US. "The idea that this is not our problem is wishful thinking at best, and catastrophic complacency at worst. Yet in the face of all evidence there has been policy paralysis in the West," he said. Colonel Tim Collins, who commanded British troops in Iraq, expressed similar sentiments in the Daily Telegraph and accused the government of failing in its "moral obligation" to intervene. "In the next months ancient civilisations will be extinguished on our watch unless we act," he said. The first drop took place on Saturday, delivering 1,200 water containers and 240 solar lanterns. On Monday, RAF crews dropped supplies including 9,000 five-litre water bottles, and 816 solar lamps that can also be used to charge mobile phones. Supplies dropped overnight in Mount Sinjar, where most of those who have fled are trapped, included 2,640 reusable water purification containers filled with clean water and 528 shelter kits. The international development secretary announced £8m in new assistance last week for those displaced in Iraq, bringing to a total £13m in UK aid committed to the crisis. Ms Greening also said four organisations - Mercy Corps, Save the Children, the International Rescue Committee and Action Against Hunger - were to share the £3m earmarked by the British government for charities operating in Iraq.